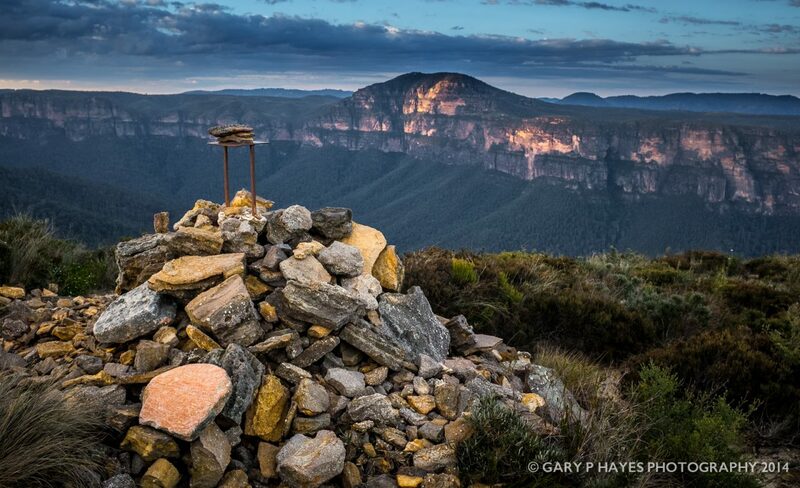 ABOUT: One of the best viewpoints up and down the tributaries of the Grose Valley within an easy 90 minute walk of a parking spot. There are three sets of views at the lookout area itself which includes good views back along Fortress Ridge and if you are lucky after rain a canyon waterfall pouring out of it’s exit high on a cliff. The best views are not from the peak, a final 5 minute push, but around it’s edge. Afternoon clouds as well as the golden hours all work well. PHOTO EQUIPMENT TO BRING: You really need to bring your whole kit as the valley views need ultra wide lenses but more than anywhere else good telephoto shots abound, so bring a 70-200 or 100-400 to spot those distant views. Tripod optional midday. GETTING TO THE SPOT/S: Keep following Mount Hay Rd past this Google spot for about 15 mins when you will see on your left, just before a sharp right downhill the Fortress Ridge Car Park, keep going for about 1km until you see another obvious parking spot for about 5 cars on the left, signposted for Lockleys & Pinnacles. Take into account walk back if doing sundown, torches are possible for the latter part coming back.